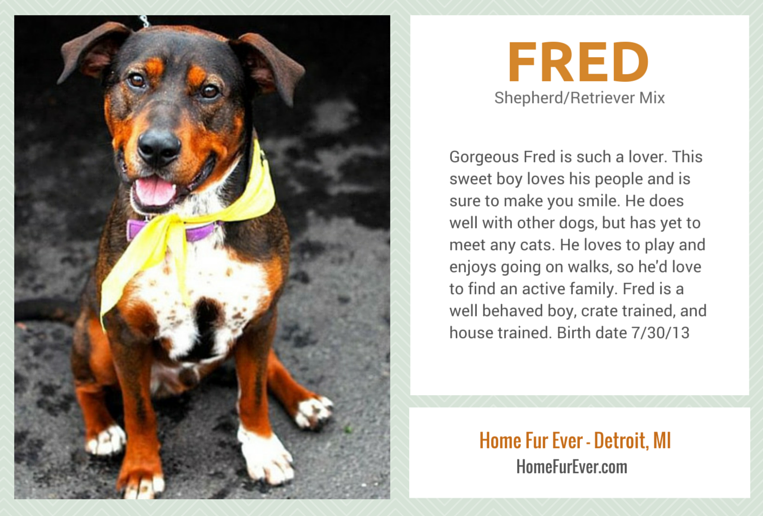 You are here: Home / Shelters & Rescue / Sweet Fred Needs a Second Chance – Detroit, MI – Adopted! What do you get when you mix a Shepherd and Retriever? One awesome dog named Fred. Fred needs a second chance; he’s patiently waiting for his forever home in Detroit, Michigan. 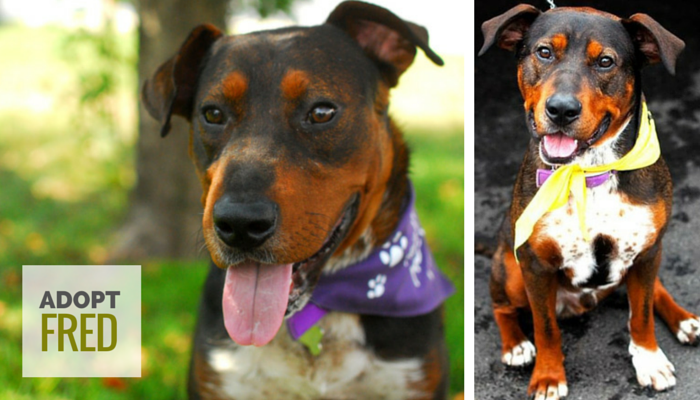 Update 08/17/15 – Fred has been adopted! 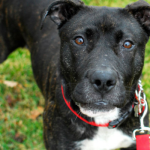 Sweet Fred needs a second chance; he’s one of the friendliest dogs you’ll ever meet. 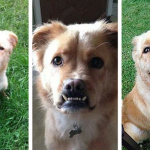 Fred is a 2 year old Retriever/Shepherd mix available for adoption through Home Fur Ever in Detroit. He does well with other dogs and children but has not been tested around cats. He loves his play time and going on walks so he’s looking for a fairly active family. He’s house broken, crate trained, and has very good manners. If you’re looking for a sweet, loving companion Fred is your guy. Home Fur Ever is non profit, no kill, rescue shelter based in Detroit. The organization was started in 2003 and has since found homes for almost 4500 dogs. At any given time Home Fur Ever might have 90-130 dogs in foster care making them one of the Detroit area’s largest rescues. Their mission is simple; give every dog a chance to find it’s FurEver home. To help find the best match for families Home Fur Ever strongly encourages the foster to adopt program. They like to give you a week or two with your new dog at home to make sure it’s a proper fit; you’re able to finalize the adoption process at any of their adoption events. Home Fur Ever strives to ensure the right dog goes to the right home. If you’re in the metro Detroit area and you’re looking for a new canine companion I recommend contacting Home Fur Ever. To meet some of their amazing dogs check out their adoption events every Saturday from 12-4, rotating between the Troy and Roseville Petcos. When going to their adoption events they encourage you to bring the whole family along – including your canine companions to make sure everyone gets along. Check their calendar for upcoming events & locations. To learn more about Home Fur Ever you can visit their site & follow them on facebook. 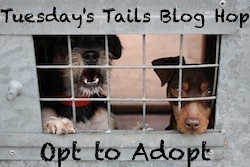 The Tuesdays Tails Blog Hop is hosted by Talking Dogs and Dogs N Pawz. 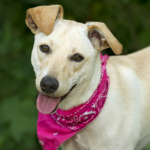 Each week we share adoptable shelter pets to help find these deserving animals a forever home. Join us or help spread the word by sharing these amazing animals. We can’t do everything, but we can each do something. 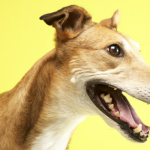 « Does Your Dog Wag His Tail to the Right or Left? Fred is such a cutie! Shared. Good luck Fred! You are adorable! I hope he finds a great home! Sharing him! He is adorable! I love his colors and markings. I like the foster to adopt methodology myself. That is how Delilah came to live with us. We took her sight unseen and I couldn’t imagine what would happen if Sampson hated her or vice versa. I love to see shelters/rescues thinking outside the and thinking of the well-being of their animals. I think there is a lesser chance of an animal being surrendered further down the road, if they give everybody adjustment time. It’s such a great program isn’t it? As you mention especially when you already have pets in the home.